Stripes + Plaid: Transitioning into Fall! 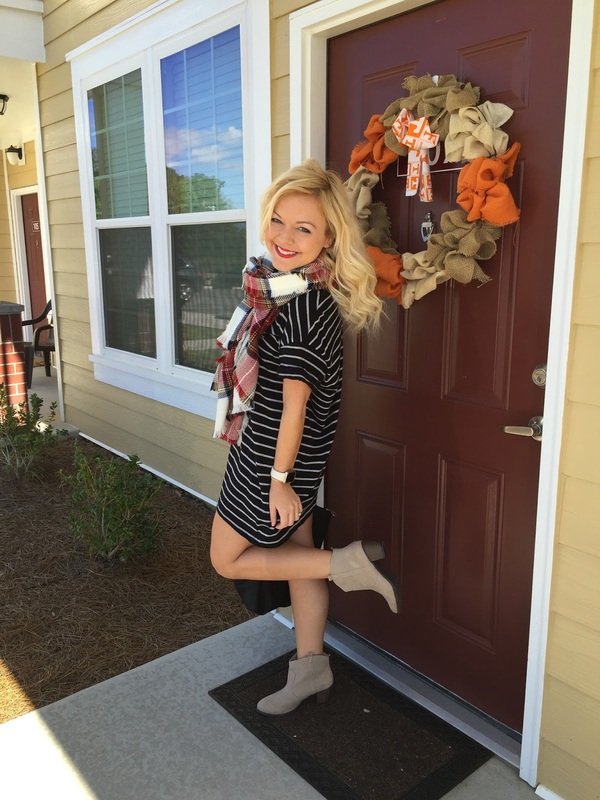 I'm beyond excited to say it finally feels like fall here in Tennessee! I had to take advantage of the temps in the 60's for a girl's day out with my Mom. As I approached Mom's car when she arrived to pick me up, she rolled her window down and said "do you want to take some outfit pictures before we leave?" Gosh I love that woman! She has always supported me from day 1 no matter what I'm doing---blogging, being a nurse, studying to be a FNP, wedding planning, etc. I can't thank her enough for her endless support of all my hopes & dreams! Needless to say I took her up on her offer to take some OOTD pics (as you can see above!). I love this weather because it's not too cold yet, so it is perfect for short sleeves & bare legs; however it is just chilly enough for booties & a scarf. 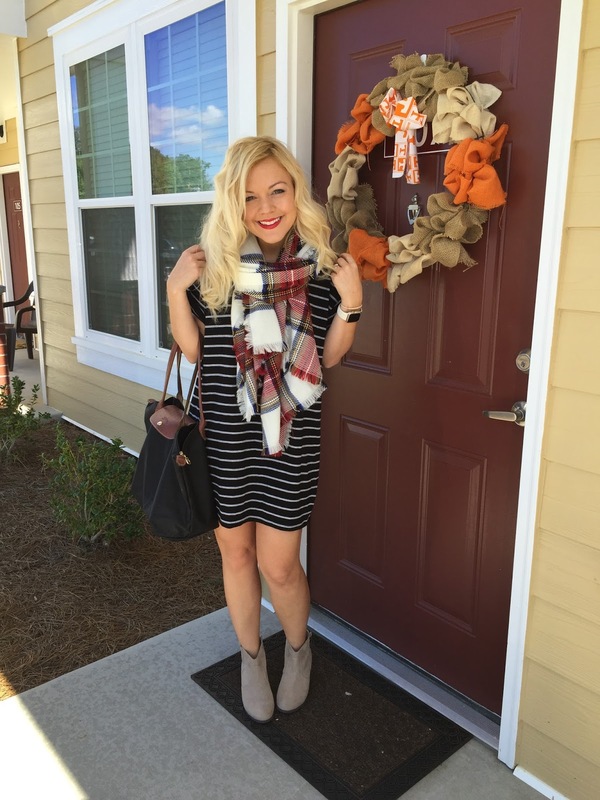 The scarf I'm wearing in this picture is one of my absolute favorites (I may or may not have it in multiple colors/prints!). I love blanket scarfs because they are super practical (warm!) and have enough material where it adds dimension to an outfit with the ability to fold it in multiple ways! I wasn't able to find the exact same print on Target's website as I'm wearing in the photos above; however, the pattern I linked I absolutely LOVE (& will have to buy to add to my collection! ha!). 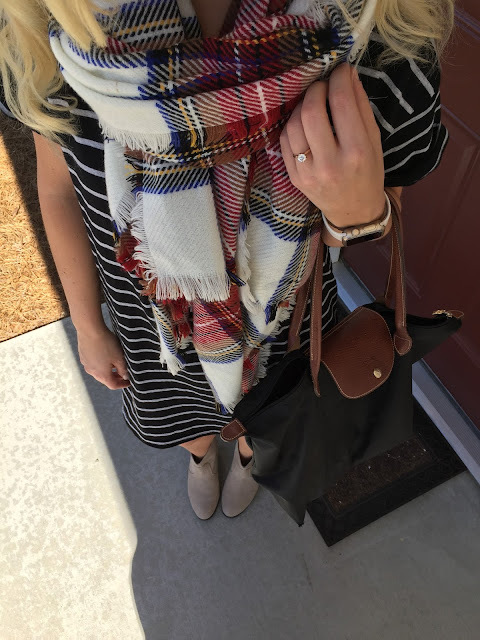 This t-shirt dress has been another one of my faves in my closet this summer and I love transitioning my summer pieces into the fall by adding fall accessories (enter: booties & a scarf). 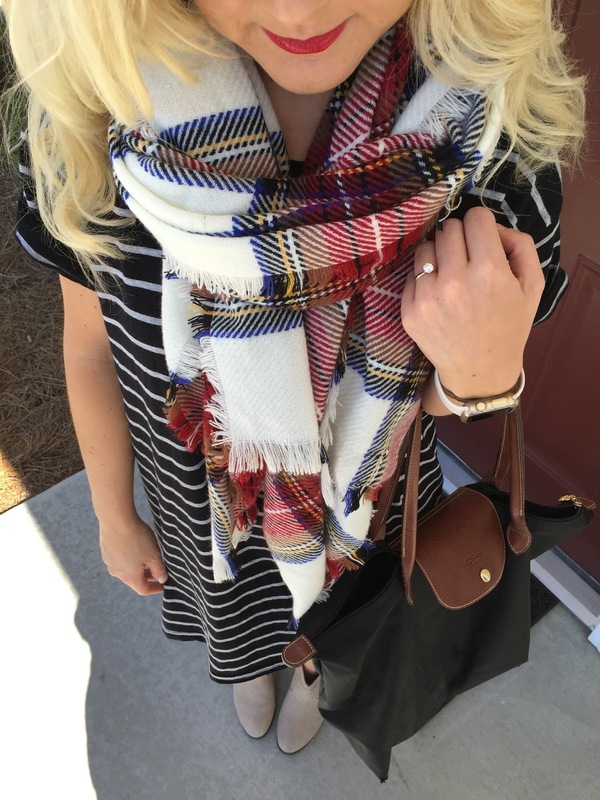 ALSO---I am in love with mixing stripes & plaid. gooooorge my friend :) Loving that you are blogging again bc I have a lot to look up to!